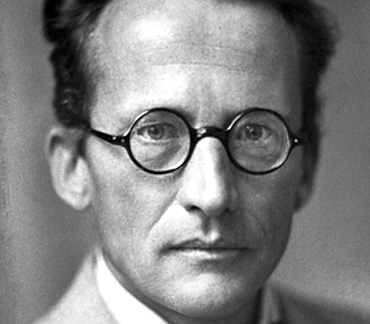 Schrödinger was a Nobel Prize-winning Austrian physicist who developed a number of fundamental results in the field of quantum theory, which formed the basis of wave mechanics: he formulated the wave equation (stationary and time-dependent Schrödinger equation) and revealed the identity of his development of the formalism and matrix mechanics. 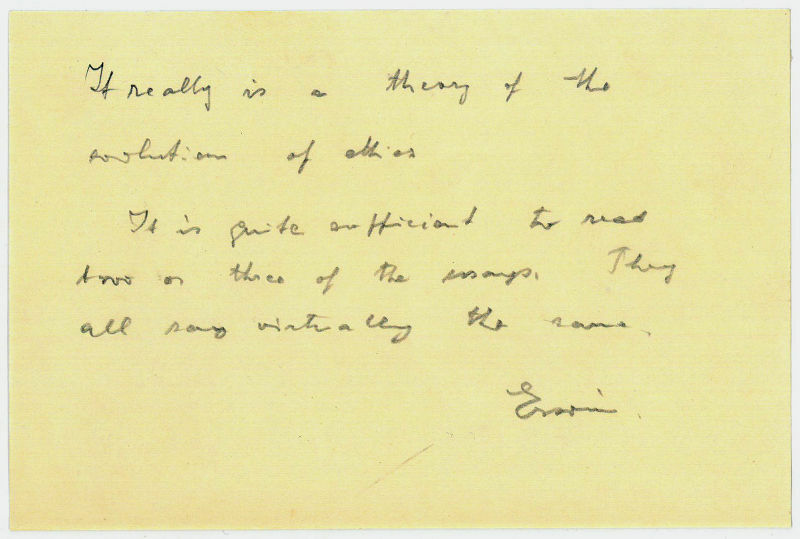 Schrödinger proposed an original interpretation of the physical meaning of the wave function. In addition, he was the author of many works in various fields of physics: statistical mechanics and thermodynamics, physics of dielectrics, colour theory, electrodynamics, general relativity, and cosmology, and he made several attempts to construct a unified field theory. 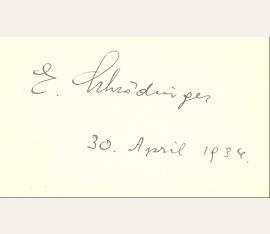 Physiker und Nobelpreisträger (1887-1961). Autograph document signed. O. O. 1 S. Qu.-kl.-8vo (87:132 mm). 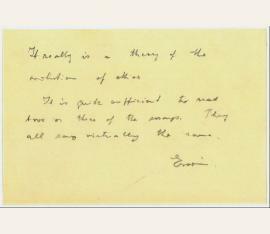 A statement to Arthur Keith's "A New Theory of Human Evolution" (London 1948): "It really is a theory of the evolution of ethics. It is quite sufficient to read two or three of the essays. They all say virtually the same. / Erwin". - In pencil. Erwin Schrödinger (1887–1961), Physiker und Nobelpreisträger. Albumblatt mit e. U. („E. Schrödinger“). O. O., 30. April 1934. 1 S. Qu.-8°. – Die Verso-Seite mit alt montiertem Portrait (Zeitungsausschnitt) und kleiner, je nach Lichteinfall auf die Recto-Seite durchschlagender Rostspur. Sehr selten. Erwin Schrödinger (1887–1961), Physiker und Nobelpreisträger. E. Briefkarte mit U. O. O., 16. Januar 1947. 1 S. Qu.-8°. – Launige Karte an einen Herrn Böhme: „Besten Dank für Ihre Zeilen vom 7. Januar. Ich muß Ihnen leider antworten: Nein, Autogramme gebe ich nicht [...]“. – Erwin Schrödinger hatte 1933 zusammen mit Paul Dirac den Nobelpreis für Physik erhalten „für die Entdeckung neuer produktiver Formen der Atomtheorie“. – Auf Briefpapier mit gedr. Briefkopf „Autogramm“. Visitenkarte mit eigenh. Grußzeile und Initialen verso. Erwin Schrödinger (1887–1961), Physiker und Nobelpreisträger. Visitenkarte mit e. Grußzeile und Initialen verso. O. O. u. D. Kleines Visitkartenformat. – „Herzlichsten Dank! | E. S.“. 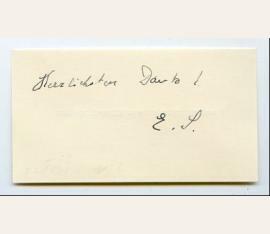 To Berthild Gerold, a close friend of Schrödinger's daughter Ruth Braunizer (née March). Ruth's mother was Hilde March, the wife of Schrödinger's friend and colleague Arthur March. She lived with the March family in their Innsbruck house, where Berthild Gerold had rented lodgings. 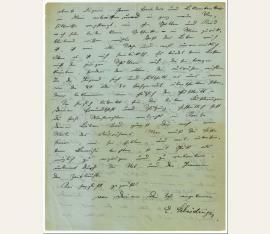 All three letters concern quarrels between Berthild and Schrödinger's daughter Ruth: "[...] One cannot ask of you to live without heating during winter, and you are entitled to share all 'amenities' of the house. 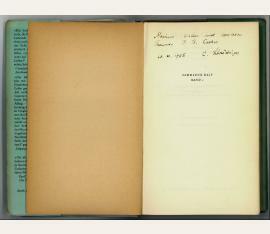 It's terrible enough to have to speak of legal rights, but this is precisely what it's about [...]" (20 Oct. 1952; transl. from the German). 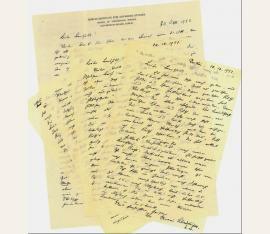 To an unnamed addressee, telling from plans to move to Jena together with his mother now that his father had died. Eigenh. Widmung mit U. in: Ders. : Was ist Leben? Die lebende Zelle mit den Augen des Physikers betrachtet". 2. Auflage. (= Sammlung Dalp, vol. 1). 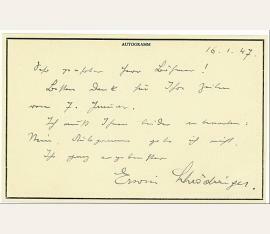 - Dedicated to the Austrian writer Franz Theodor Csokor in 1956. - Slightly browned due to paper; original wrapper somewhat spotty and with some damage to edges. Eigenh. 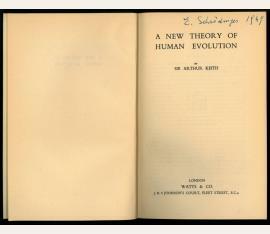 Unterschrift in: Arthur Keith: A New Theory Of Human Evolution.